If not frosting cupcakes, you can also combine 1 tbsp fine sugar with 1 tsp cinnamon powder and dust over the cupcakes. Take all wet ingredients in an another wide bowl and whisk to combine evenly. Add dry ingredients into wet ingredients in 3 batches and combine with gentle stroke after each addition until just combined. Do not overmix. Scoop the batter evenly into cupcake molds. 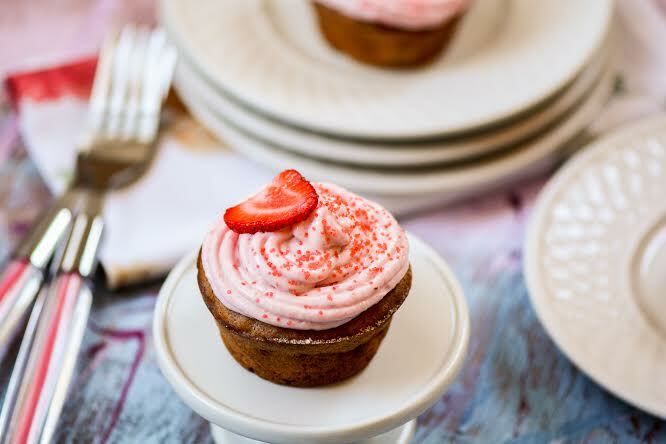 Top each cupcakes with slice of strawberry. Bake for 12 -14 minutes at 350 °F or until cupcakes are done and springy to touch. Let them cool in pan for a few minutes, then remove to a cooling rack to cool completely. In a large bowl or jar of stand mixer, beat soft butter until creamy. Add in confectioners' sugar, strawberries puree and milk and continue beating until nice and fluffy. Transfer frosting into piping bag and frost the cupcakes. Top each cupcake with slice of strawberry for garnish. I used non-stick cupcake pan, so not used liners. If using regular pan, always use cupcakes liners. If can't find strawberry essence, you can also use vanilla extract instead.